Home Any Graduate Job in TATA Business Support Services Ltd Jobs in Chennai Jobs in Experienced Jobs in Freshers TATA Business Support Services Ltd Job Opening || Freshers/Any Graduate @ Chennai - Apply Now. 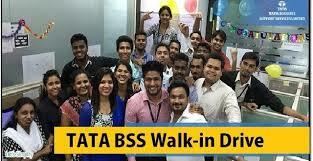 TATA Business Support Services Ltd Job Opening || Freshers/Any Graduate @ Chennai - Apply Now. TATA Business Support Services Ltd Jobs openings for Customer care Executives download application at www.tata.com. TATA Business Support Services Ltd has invited applications from interested, eligible candidates to fill in the vacancies Interested candidates can apply on through official website.who have not applied until now can follow the instructions below and apply online on TATA Business Support Services Ltd Job Opening || Freshers/Any Graduate @ Chennai - Apply Now. Salary: INR-1,50,000 - 1,75,000 P.A. Tata Group is an Indian multinational conglomerate holding company headquartered in Mumbai, Maharashtra, India. Founded in 1868 by Jamshedji Tata, the company gained international recognition after purchasing several global companies. One of India's largest conglomerates, Tata Group is owned by "Tata Sons", a registered charity. We have an urgent requirement for Voice Process. Handling Customer Services related calls. Handling Welcome Calling, Retention Calling, CSAT etc. To maintain customer data & update the Team Leader. Handling all bank related queries. Candidates should speak Telugu / Malayalam / Hindi / Kannda with BPO experience.